In this world of increasingly grey areas, one thing is absolute: children adore animals. There’s nothing simpler or more meaningful than the bond between a pet and his or her young master/mistress/guardian/playmate/partner in crime. That being said, many dynamic duos need a little help to make sure everyone remains safe. Wondering how to make the world of children and pet safety easier on the whole family? Arlington Animal Hospital is here to help! Welcoming an animal into your home has unlimited benefits. 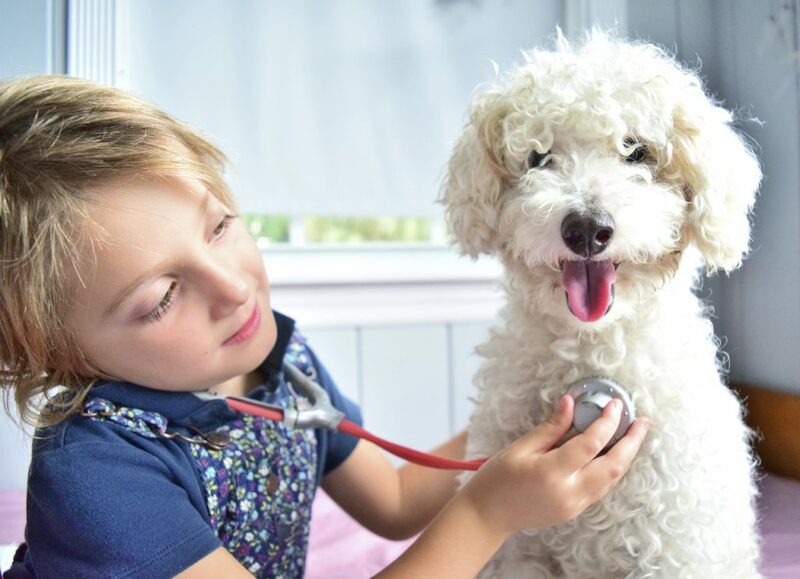 Pets tap into your child’s potential for learning trust, respect, compassion, empathy, and caring. They can even boost his or her self-esteem. However, your child must be patient, understanding, and accommodating to the myriad needs of a new pet. Never allow your pet to play alone with your children. Supervise all interactions closely. Teach children not to interfere with a pet who is sleeping, eating, resting in a crate, or chewing on a toy. Model how to softly touch and pet your cat or dog. Emphasize that the pet should never be handled from behind. Show children how to control their voices around your pet, and inform them that animals do not enjoy sudden movements. Teach children how to extend a hand to your pet, palm facing up, and invite your pet to sniff it. Do not allow children to touch a pet’s eyes, inner ears, mouth, nose, or genital area. Encourage children to back away from a pet during excited moments, such as the doorbell ringing, squirrel in the backyard, etc. Depending on your child’s age, he or she may be ready to help clean up after the family pet. Until that time comes, prohibit children from touching or playing near animal waste. The litter box can be all too tempting to little hands, so we urge you to make it clear how dangerous it can be for kids. If you’re bringing a dog into the fold, remember that canines are pack animals and hold fast to the concept of dominance and submission. When a dog sees a young child as an equal or lower in the pack, hierarchical problems can occur. You may notice that your dog knocks down your child or bumps into him or her; it’s critical that you intervene at once. It can be difficult to establish, but your dog must understand his or her place to achieve success with children and pet safety. A professional pet trainer could help guide you toward teaching everyone in the family how to live together happily! Taking simple precautions, we hope everyone in your household remains safe, healthy, and happy. Our team is always here to help, and we hope you’ll contact us with any questions or concerns.